Mallinckrodt Institute of Radiology at Washington University School of Medicine, St. Louis, recently became the first health care institution in the United States to install the MAGNETOM Vida, a 3 Tesla (3T) magnetic resonance imaging (MRI) scanner from Siemens Healthineers. The scanner features new BioMatrix technology that addresses patients’ anatomical and physiological differences as well as user variability. By expanding precision medicine through systems such as the MAGNETOM Vida with BioMatrix technology, Siemens Healthineers can help enable health care providers to achieve better outcomes at lower cost. The 70-cm MAGNETOM Vida MRI scanner includes a new magnet design and up to 60/200 XT gradient performance to support high-end clinical applications. Its BioMatrix technology – a collection of sensors, tuners and interfaces – enables the scanner to adapt automatically to anatomical and physiological characteristics to provide consistent, high-quality imaging for all patient types. The scanner’s architecture and applications simplify and accelerate workflows while increasing exam precision and patient comfort. Its GO technologies automate and simplify workflows from the start of the scan through quality control of the image data, resulting in increased productivity for routine examinations throughout the body. And the Eco-Power technology deactivates power-hungry components that are inactive for long periods, potentially lowering the total cost of ownership over the scanner’s lifetime. 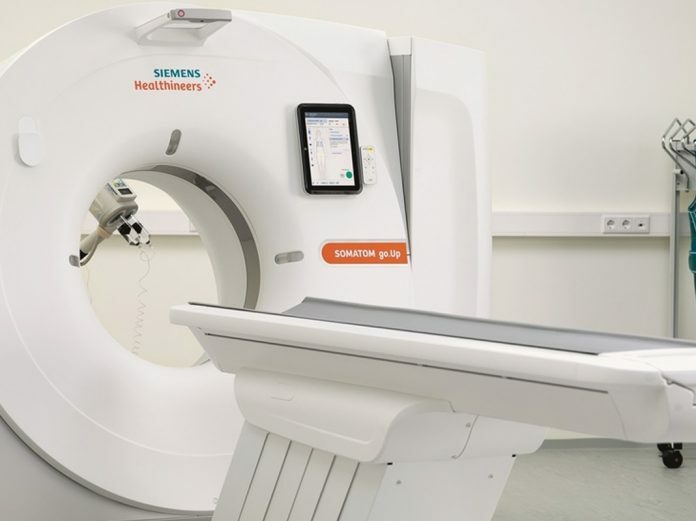 In other news, the Center for Diagnostic Imaging (CDI) recently became the first health care organization in the United States to install the SOMATOM go.Up computed tomography (CT) system from Siemens Healthineers. The SOMATOM go.Up scanners are installed at two CDI outpatient imaging facilities associated with St. Luke’s Hospital in St. Louis. The SOMATOM go.Up is designed for highly diverse sets of user needs and provides automated, standardized workflows that help users reduce unwanted variations and achieve more consistent, profound clinical results at a lower total cost of ownership.